During Chinese New Year, there are many red decorations hung outside houses and on the sides of doors. Red is the main color for the festival and it is believed to be lucky. 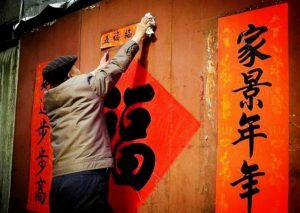 Some decorations are red lanterns, others red couplets or paper with fortunate sayings on it written in calligraphy. Depending on what year it is, there may be different decorations based on which animal it is this year. 2018 is the Year of the Dog, so you may spot some dog decorations! 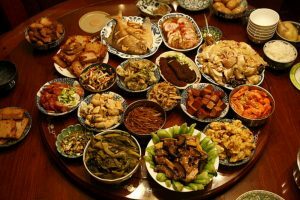 The dinner eaten on New Year’s Eve is called Reunion Dinner and many believe that it is the most important meal of the whole year. Relatives sit around tables and eat dishes with lucky meanings and sayings. Some foods we typically eat are dumplings, fish and spring rolls. There are foods with special Mandarin sayings, like fish (excess money), oranges (good fortune), and apples (safety). 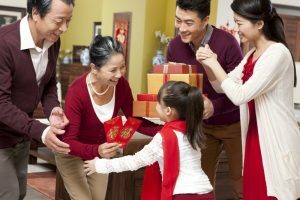 It is a tradition for the parents and people of the older generation to give the younger generation or retired family members red envelopes, typically by hand. Red envelopes are small red paper bags that are thought to bring good luck and often contain money. It is similar to Christmas in other countries. Sometimes, traditional dances are performed in temples or other areas. 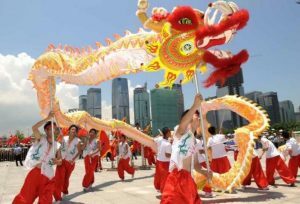 There are dragon dances, lion dances, and imperial performances. The Chinese Dragon represents wisdom, power, and wealth. The dance originated from a ceremony worshiping ancestors and praying for rain. Additionally, the costume is made of cloth and has several joints, or bamboo sticks held by the dancers so they can manipulate and move the dragon. They also offer a lot of traditional Chinese products and snacks that aren’t normally seen throughout the year.